When it comes to losing weight we all need a little help from time to time. Some of our greatest barriers to success are our own cravings and strong appetites, our lack of willpower and our eating habits associated with emotions. Why not get that help in the form of a natural supplement. Geneceuticals Saffron Extract claims support weight loss by helping to suppress your appetite and boost your mood. It may also aid you to avoid those emotional eating habits such as binge eating and emotional eating. For more information on Geneceuticals Saffron Extract, continue reading our review. Saffron Extract (88.25mg per capsule) is the main active ingredient in the product and is said to play roles in suppressing appetite and combat depression. Saffron is commonly used as a spice extracted from the Crocus Sativus plant and is very labor intensive to harvest, making it the most expensive spice per gram. Saffron extract has also been known to aid with conditions such as asthma and joint health. These capsules are made from vegetable cellulose and not gelatin, making them vegan and vegetarian-friendly. 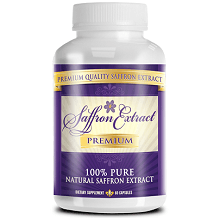 Unfortunately, the adequate daily value has not yet been established for saffron extract. The manufacturers recommend taking one capsule a day. For optimal results, it is to be taken 30 minutes before a meal, with an 8oz. glass of water. Be cautious when using this as a pregnant or nursing mother, if you are under younger than 18 or if you have an existing medical condition. Rather be safe and consult your physician beforehand. Geneceuticals mentions no side effects from taking their Saffron Extract product. This active ingredient has been associated with side effects such as dizziness, dry mouth, headache, drowsiness, and nausea, but this is seldom, and a healthy adult should not experience these. This product is available on Amazon for $13.97 for a bottle containing 60-capsules. For such an expensive spice, we are surprised at the low-price of the capsules. This may be an indication of the quality of the capsules. The manufacturers do provide a 90-day money back guarantee, and specifically mention if you do not lose weight you can claim back your money. A very bold statement to make. 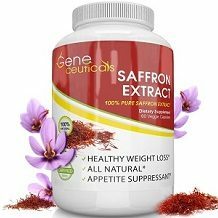 Geneceuticals Saffron Extract seems to be a promising product to aid in appetite suppression and mood improvement, all measures that should lead to weight loss. In fact, the manufacturers are so confident that their product will lead to weight loss that they have put a 90-day money back guarantee on it. Their capsules are also vegan and vegetarian-friendly. Unfortunately, we have found a few negative reviews online and along with that the low price of the product leaves wondering about the quality of the saffron we recommend looking at other similar products on the market before making a final decision.